At job interviews I always say software development is a creative profession in my view. From that moment on the job interview gets interesting, because if my worldview clashes with the company’s, there is no match. Often at least my view aroused interest, and I get the chance to explain: I am not a technical person. At high school I learned as little mathematics as possible, and in college I majored in Literature. I viewed computers as necessary tools, without being excessively interested in them. But after college I got more and more the urge to make something, something that worked and that people could actually use. That is when I discovered programming. It was exactly what I was looking for. The learning curve is somewhat steep, but afterwards the possibilities are endless. The trajectory from idea to prototype is as short as could be. And it turned out that I did not have to be technical: there was no mathematics involved, and the computer continued to be nothing more but a necessary tool. DevArt is a celebration of art made with code by artists that push the possibilities of creativity – where technology is their canvas and code is their raw material. This description fits the Creative Coder perfectly. Instead of executing assignment after assignment without question, the Creative Coder develops from idea to prototype to complete realisation. Just like an artist. I am not saying here that every developer should be an artist. Companies also need people that are specialised in technology, and are passionate about it. This is the “Technical Professional”-type of developer, whom I much respect. This kind of developer is commercially very valuable because he takes the quality of his work seriously, takes responsibility for completing projects within budget, works effectively with other team members, etc. I am also not saying that the Creative Coder can be creative 100% of the time. Sometimes assignments with less room for creative exploration have to be done. But I do believe that having a Creative Coder inside a team or a company can be a very innovative force. The drive to be creative leads not only to improvements on existing products and services, but also leads to new combinations and completely new applications, that could be marketed. Is the Creative Coder a Hacker? No. The Creative Coder shares with the Hacker the urge of exploring new roads and doing things the unconventional way. But the Hacker only builds things for himself, and does not really care about being commercially profitable. The Hacker is also less likely to work in a team with people from other fields, and is focussed more on technology than functionality. 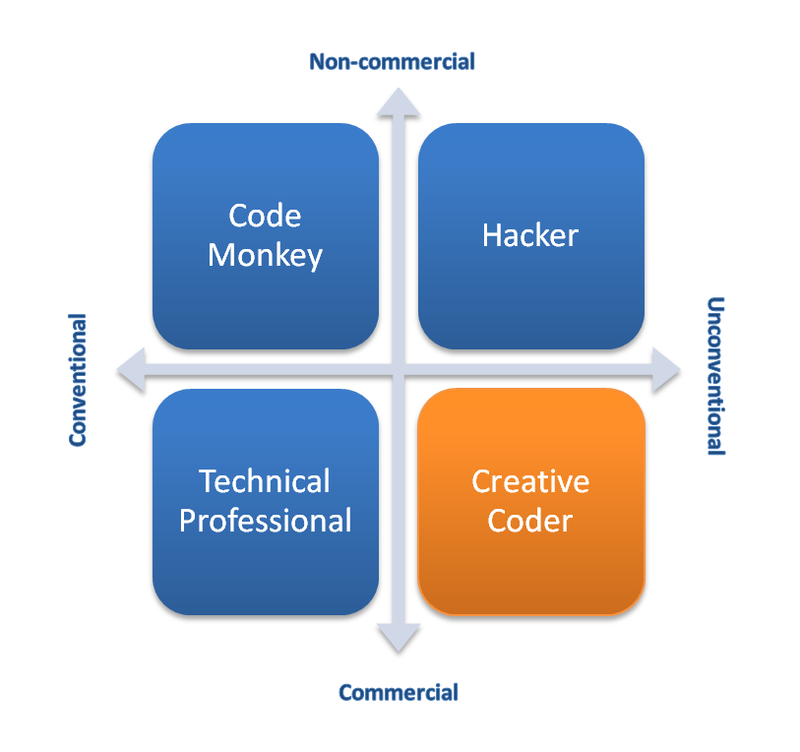 In the graph above these four types of developers are related to each other, including the Technical Professional and the Hacker. One thing a Creative Coder hates is being a “Code Monkey”: just doing your job, without asking questions, without the possibility to explore new paths, and without having the slightest influence on what you’re making in the first place. Developers belong to the “Creative Class”, according to the American social scientist Richard Florida. Just like visual designers, writers, artists, architects, marketeers and scientists, developers are engaged in making new things. This is the group of which the lionshare of future economic growth is expected. Also in the Netherlands, many cities are trying to attract the Creative Class. I think it is justified that Florida counts developers to the Creative Class, but not all developers. There is a big difference between a Code Monkey and a Creative Coder. That is why I think it is important that developers (and the people that hire developers) are aware of their enormous creative potential. I think much developers are doing this already, because creativity is an urge that is hard to temper. I also think that programming at schools should not solely be presented as a “technical” course. That does no justice to what makes programming so appealing: being able to bring your own ideas to alive into things that actually work! Programming is surely a creative profession as well. Totally agree. I always had some interest in coding, but never did more than fiddle. Off to uni to do law and psych, and then joined a large company. Eventually I found the most interesting way to solve business problems is to code something. Explaining the business part to someone in IT who doesn’t care never gives you an enduring solution. The most efficient approach is having one person understand the problem space as well as solve it. Great post!